loving the amount of #fsharp talks submitted to #dddea ! Follow me on teh twitterz! Following up from @isaac_abraham’s awesome F# Enigma machine emulator, I decided it would be 10x cooler if it was in a type provider, because let’s face it, everything is 10x cooler once it’s in a type provider. Here a some pictures of it in action! 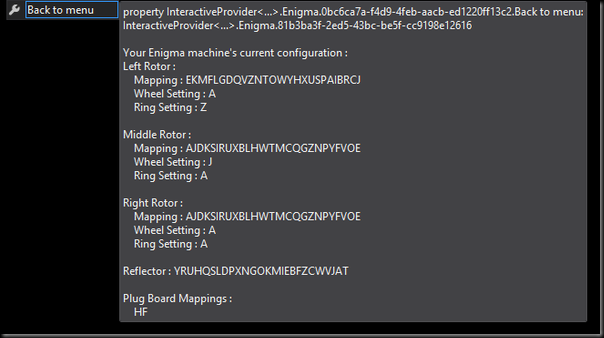 As you can see, it uses an extensive property system that presents a menu along with the various controls to setup your enigma machine, and then finally to translate some text. This TP is written with my InteractiveProvider as per usual. On my first attempt at this during my lunch break today, I did succeed but I was growing increasingly frustrated with the somewhat contrived mechanism with which to process responses from properties, the text to display in intellisense, and the properties to show. The InteractiveProvider (henceforth known as IP) presents a very flexible yet slightly complicated interface with which to generate types. Essentially, you implement IInteractiveState on some state object of your design, and IInteractiveServer on another type, which deals with processing responses. The IP will display intellisense and options via the state, and when the user selects a property, the server decides what to do with it and returns some new state. The creation of the text and properties is separate from the response handling of that property. This can make it hard to read and reason about. Although each state might require its own unique data, there is not any way to represent one thing without threading all the previous state through. For example, if I want the user to enter a bunch of letters via properties until they press the [End] property, I can’t do this with just a string, Id have to carry the rest of whatever data I was using as well. This gets unwieldy quickly. There is no way to separate concerns. Again on with point 3, because of this it is not really possible to create re-usable chunks of state that perform common functions such as accepting input. This new record type is essentially a super-duper state object. It brings together the creation of stuff and the processing of responses into the same place. You can see it takes 3 functions and a bit of state, ‘a. displayOptions will be called with the current ‘a and is expected to generate a list of properties to display and a boxed version of some type that will be passed back to the server when the user selects that property. Because this is a generic type, it does mean when you start to use these together, they are going to need the same ‘a which is a bit of a pain, but it is readily solved by creating a DU of all the possible types that the various states in your system need. 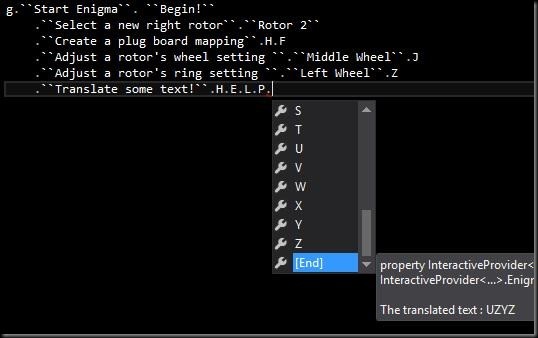 member x.Enigma = match x with Core e -> e | _ -> failwith ""
member x.String = match x with Strings s -> s | _ -> failwith ""
member x.Rotor = match x with Rotors r -> r | _ -> failwith ""
displayText = fun _ -> "Welcome to the type provider Enigma machine!" this is as simple as it gets and not doing much interesting, you can see it returns one property “Begin!” along with a boxed unit type. I don’t care about the response type as there is only one property so I know it must be that being selected. processResponse simply creates the next state using the function mainMenu( .. ) which it passes the current state, in this case the default version of the enigma machine. The first bits are pretty straight forward, it shows the various menu options and boxes which one was selected using the DU defined above. processResponse then unboxes the return value, matches on it, then does something with the result. A continuation function, that accepts the completed output and then generates some other state. What is really awesome with is is that the enterText function simply takes a string – it doesn’t know or care about the Enigma object – this is made possible by the fact that we can now create a closure over the previous state’s data within the continuation lambda function, allowing us to decouple the recursive-text-entering portion of the type system. Very nice! displayText = fun d -> "Select a rotor." 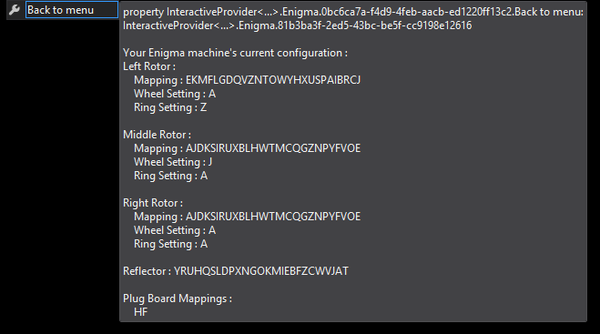 When the SetRingPosition menu item is selected, it returns the selectMachineRotor function, and the continuation function passed to uses the enterText function allowing the user to pick a letter, and finally the result is applied to the Enigma object and the whole thin is returned back to the main menu. Very cool! The IP has had a bit of a face-lift which makes it easier to write and read what is going on. Plus you can have an Enigma machine in a type provider. Who wouldn’t want that! The code is a little bit of a mess at the moment, but I should clean it up soon and move the new super-state into the common interfaces project.